Every winter when the ocean buoys start to read 10-, 15-, and 20-feet, the coast of Half Moon Bay, California, is transformed by an enormous wave called Maverick's. Recognized as one of the most dangerous big wave surf breaks in the world, Maverick's is big, cold, and sickeningly powerful. It's the best show in town, but until now you could only see it through a pair of binoculars. 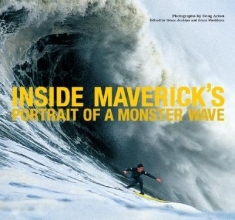 "Inside Maverick's" brings you right onto the sickening ledge of a 75-foot wave with jaw-dropping photographs and gritty insider accounts of what it's really like out there. Sports columnist Bruce Jenkins and Maverick's surfer Grant Washburn have interviewed top big wave surfers Peter Mel, Zach Wourmhoudt, Evan Slater, and others to discuss every aspect of the freakish wave from the paddle out to the terrifying drop to the inevitable and brutal wipeouts. Covering fifteen years of incredible surfing with photos that have never before been published, "Inside Maverick's" grants unparalleled access to this legendary wave and the elite core of big wave surfers that are obsessed with challenging it.